You can spot a credit repair scam by asking a few simple questions and looking out for the tell-tale signs of the scam artist. Those signs include pressure for up front payment and the general inability to answer specific questions about the services being offered. August 22, 2018 - What kind of credit advice do you need to buy a home? One of the first things you’ll learn either through research or the hard way is not to pay third party companies that make all sorts of unverifiable promises about fixing your credit or doing credit repair for a fee, especially a fee that is demanded up front for services that promise a specific increase in FICO scores. Many of the so-called credit repair techniques used by third party companies are things that the FHA loan applicant may do on his or her own long before the home loan is applied for. You can spot a credit repair scam by asking a few simple questions and looking out for the tell-tale signs of the scam artist. 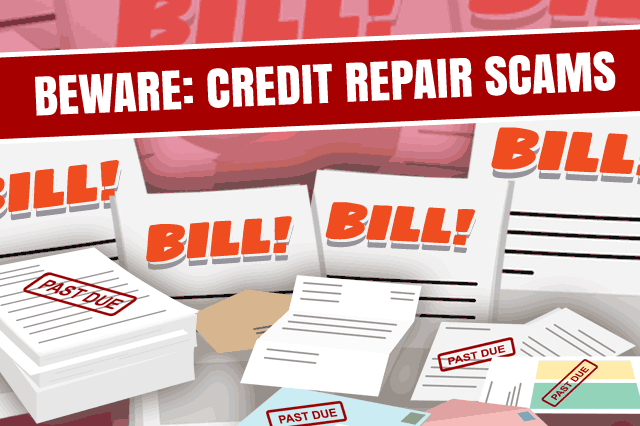 Those signs include pressure for up front payment and the general inability to answer specific questions about the services the third-party credit repair company claims to offer. You should also be very wary of any so-called credit repair agency that refuses to explain your rights to you as they pertain to credit, credit repair, and related issues. One of those rights the company may refuse to explain involves your ability to cancel the credit repair plan you have signed up for within three business days of doing so AND at no cost to the consumer. Another warning sign that you are experiencing a scam is when a credit repair or credit counseling agency offers to remove negative information from your credit report. Any accurate data on your credit reports will NOT be removed even if it is negative, and a company that promises you to remove negative, but accurate credit report information is not telling you the truth. Did you know that you have the right to contact the three major credit reporting agencies personally and review your credit information? One common practice among some bad credit repair scam artists is to urge the consumer not to contact the credit agencies directly. It does not matter why they are telling you not to do this; any such advice should be a major red flag to the consumer. Don’t be fooled by third party companies offering to fix your credit with a guaranteed increase in your credit score as you work your way toward becoming ready for your FHA home loan application. Credit fixes that require payment upfront and sound too good to be true may turn out to be exactly that-too good to be true.